​​​​​When it comes to housing, sustainability is about designing, constructing and living in houses in ways that don’t compromise the quality of the natural environment, now or in the future. 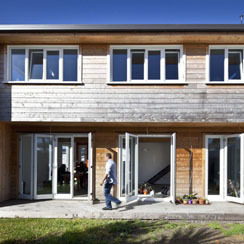 The design and build of a growing number of New Zealand homes is being guided by consideration of their impact on the environment, and as more and more people consider their homes in this way, industry is changing the way it provides housing. This series of articles is designed to empower you to achieve sustainability outcomes in your own home, based on what is most important to you. The core message emphasised throughout is that sustainability outcomes require a goal-driven process that considers integrated and ​connected approaches. This first article outlines the types of impacts housing can have and then presents different approaches to incorporating sustainability in a housing project. Each approach has different areas of focus, results in different levels of performance, and involves different amounts of time and commitment.